The cartridge, via its diamond tip, makes contact with the record surface, and it translates the undulations of the recording grooves into electrical signals which can be amplified and played through a loudspeaker. It's function is to do this as accurately as possible, without changing the signal, and with minimum wear on the record. of one to two grams. The cartridge is truly a precision instrument which, at the very beginning of the high fidelity chain, has a very important influence on the quality of the recorded sound. 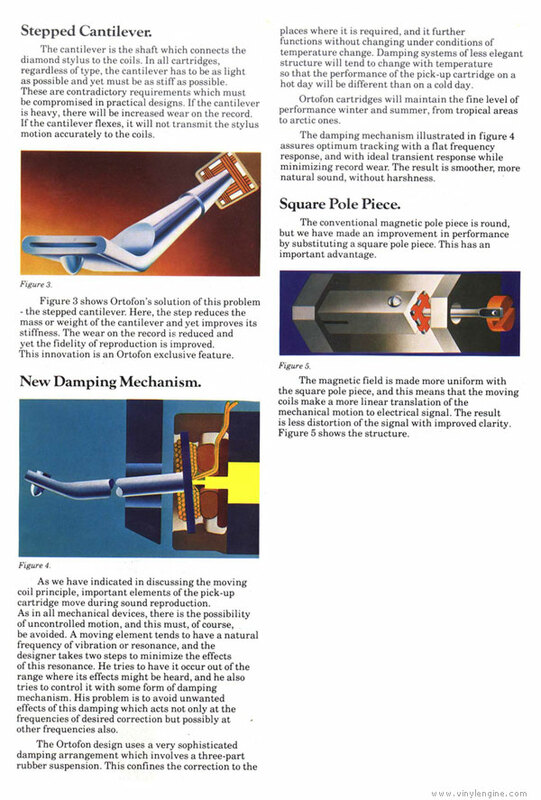 There are two principal cartridge types (although some esoteric other principles are available) - the magnetic type which involves moving a magnet or a piece of magnetic material in a magnetic field and the dynamic type in which a coil is moved in a magnetic field. 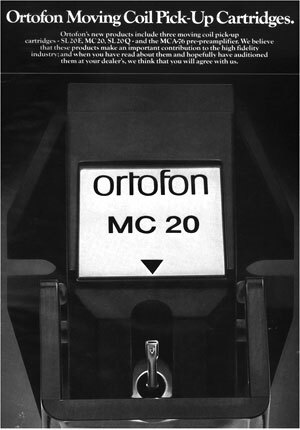 It is this latter type to which we refer as moving coil which Ortofon is using in these new products. 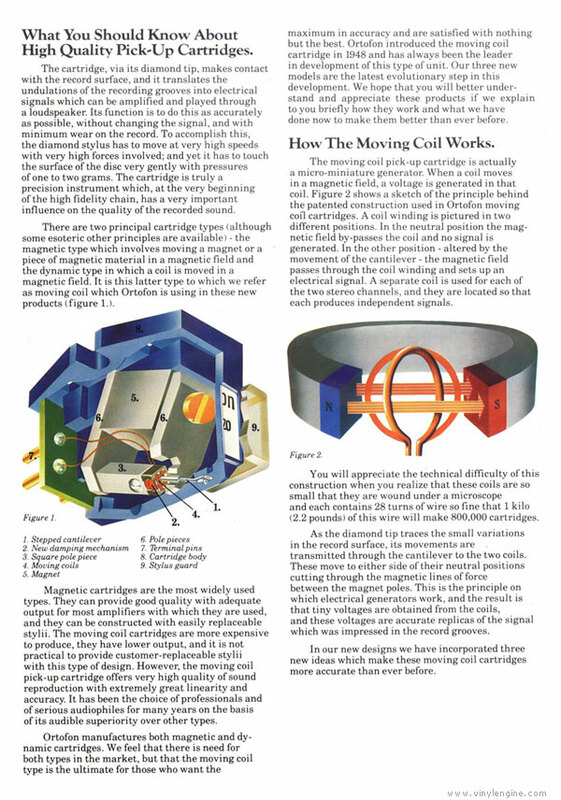 Ortofon Moving Coil Pickup Cartridges / Moving Coil Phono Cartridges owners manual, service manuals and schematics are for reference only and the Vinyl Engine bears no responsibility for errors or other inaccuracies. The PDF files are provided under strict licence. Reproduction without prior permission or for financial gain is strictly prohibited. 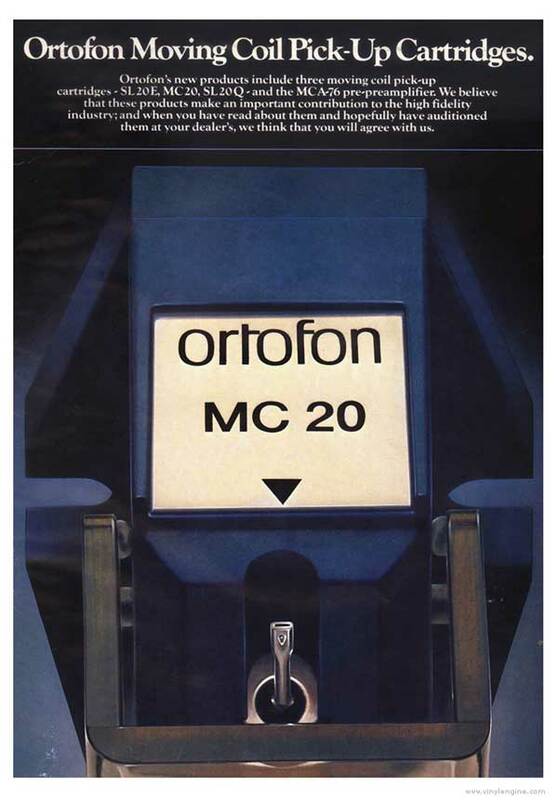 This website is not affiliated with or sponsored by Ortofon.